This article was mostly written for Jaroslav Šipoša of Aikido Dojo Uzumaki, who was interested about this topic from the point of view of someone who is more involved with swords. That's why you'll see both european and japan approaches to this topic, and also why I won't really dig into all the subtleties. If you are a veteran of many battles, this article probably isn't for you. Full discussion of this theme would take up several books, one that has followed people pretty much all over the world, when something sufficiently swordy was invented - fine, fine, we don't really have sources about, say, aztecs, but I'd bet good money on there being a debate over respective advantages of a short spear against macuahuitl. So, to keep this monster of a topic in check, I will focus not only on two specific periods of history, but on specific manuals as well. Before I reveal which ones, there is one important caveat to this debate, and one myth that persistently refuses to die. Not all swords are the same, sometimes they are quite different. A truly revolutionary concept! The shape of the sword, though, has a major impact on how it's used - some swords are better at cutting, some at thrusting, and some are somewhere in between. And then we have the extremes, when a sword is so specialized on one thing, it can barely do the other. 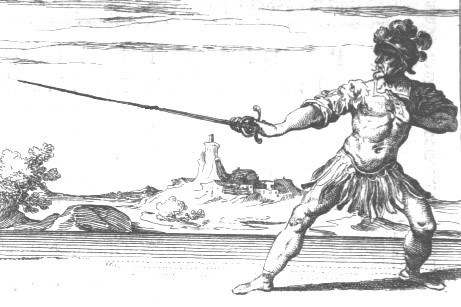 Good examples are european rapier and indian tulwar - you can, technically smack someone on the head with rapier, but it will, at best, distract him, and tulwar has such a pronounced curve to its' blade, it can't really stab in a conventional sense. A small, yet important, reminder: both rapier and tulwar can be made in slightly different shapes, so there are rapiers that can cut pretty well, and reasonably stabby tulwars, I'm merely showing the extremes here. Today on Mythbusters, we take a look of relative speed of cut and thrust, Jamie! (please, please, don't sue me) Seriously, though, the myth that thrust is somehow faster than cut is pretty persistent, and I suspect rapierists for spreading it. And space monkeys. Bot mostly the rapierists. Yes, if I'm in a position that most rapier fencers use, my cut will take longer to perform, since I have to lift my point first to do it in the first place. If you change the position to one better suited to cutting, though, the situation reverses. Measurements show that a punch of a good boxer takes about 200 ms and longsword cut about 250 ms, and since humans need 200 to 400 ms to react to stimuli, the difference here is rather insignificant. Of course, this topic is much more complex - there are several types of reaction times, for one thing - but it's not the focus of this article. Well then, let's get to it. Two manuals I'll cover here are the oldest japanese fighting manual, The Book of Five Rings by Musashiho (1645), and one of the oldest europen ones, Flower of Battle by Fiore dei Liberi (1409). Both manuals describe (among others) fighting with a sword usable in one or both hands, and both authors had extensive experience with combat, both personally and as instructors. Neither of the manuals says anything about thrust or cut being better, and both of them use both cut and thrust (also, this sentence could probably use more synonyms). Interestingly, Musashi warns us not to “cut with the long sword as you do with short,” likely meaning distinction between a chopping and a cutting blow. Out of 19 techniques described by Musashi, 3 are centered around thrusts, 4 are attacks with the body and 12 are cuts. Fiore lists 12 basic stances for fighting with a sword in both hands, 3 used to launch cuts, 7 to launch thrusts and 2 can do bothť. Fiore also lists seven blows and five thrusts of the sword. From five basic stances in aikido, two center around cuts (jodan no kamae, hasso no kamae), two around thrusts (chudan no kamae, gedan no kamae), and one can be used for both (waki gamae). As we could probably have guessed from the shape of the weapons, european fencing is oriented more around thrusts, and japanese around cuts, although both types of attacks form an important and essential part of both styles. Well, we reached a nice enough conclusion, what does the actual use of the weapons in fighting tell us, though? Sadly, we don't have enough data from either of the time periods to be able to make any statistically significant conclusionť (why yes, I am a huge nerd). There is hope for us yet, though. There was a time period when two styles of swordsmanship, one using cut, other thrust, met in actual combat - british military operations in India - and we have a large collection of not only personal accounts, but also reports of surgeons.